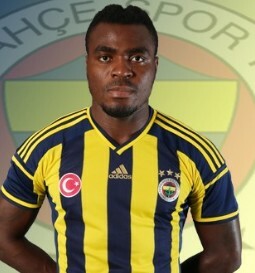 Former Nigeria striker Emmanuel Emenike has joined Greek champions Olympiakos from Turkish club Fenerbahce. He has signed a two-year deal and the fee is said to be about $2.8 million. "I know there are big expectations from the fans and club, but I am ready," the 30-year-old told BBC Sport. "I've joined the most succesful club in Greek football and I want to give my best for the team,"
He endured a turbulent period at Fenerbahce having initially transferred to the Turkish side from rivals Karabukspor in 2011. A match-fixing scandal, for which he was later cleared, prompted the Istanbul club to sell him to Russian side Spartak Moscow less than two months later. He scored 24 goals in 51 appearances for the Moscow side before re-joining Fenerbahce in 2013 and helped propel them to the league and cup double in 2014. Emenike, who was top scorer at the 2013 African Cup of Nations, has a chance to get his career back on track after his struggles in the last two seasons. He spent six months on loan at Arabian Gulf League side Al-Ain in the United Arab Emirates, where he scored seven times before spending the second-half of the 2015/16 season at English side West Ham United where he managed four goals in 19 appearances. The 30-year-old scored eight goals in 27 matches in his final season with Fenerbache. A Nations Cup winner with Nigeria in 2013, Emenike started all four of the Super Eagles' matches at the 2014 World Cup in Brazil.